Join Ignatius Press, Fr. Andrew Apostoli, and Steve & Janet Ray on a pilgrimage to celebrate the 100th Anniversary of the Apparitions at Fatima! May 16 – 25, 2017. Click here to learn more! Probably the best Catholic documentary ever made. 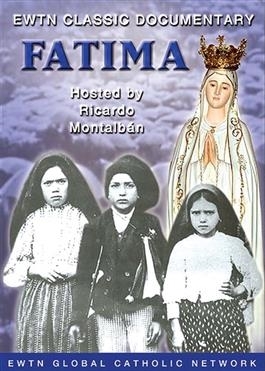 Film footage of World War I and clips from the Warner Brothers film on Fatima create the context of Ricardo Montalban's convincing narrative. Also: on-location footage and expert commentary by Malcolm Muggeridge, Alexander Solzhenitsyn, James Hitchcock, and Warren Carroll.